I love the reaction when I bring this giant chocolate chunk cookie out after dinner. Adults momentarily turn back into children. Children can’t believe their eyes. This recipe is a doddle to make and a joy to eat, and it can be frozen so you will always have a dreamy fuss-free dessert on hand. Play around with the chocolate to suit you. I find all milk chocolate too sweet so I mix dark and milk chocolate. Even dark chocolate haters enjoy this mix as the rest of the cookie is sweet enough to balance it out. For Easter, I squished a few mini eggs in too and they added a gorgeous crunch, the chocolate melts inside the shell so you get little surprises as you chomp. I first had this in a restaurant in Seattle, where it came in the lovely black cast iron skillet (frying pan) it had been cooked in. The pan sat on a wooden board with a jar of ice cream sitting next to it, ready to be dumped on top. 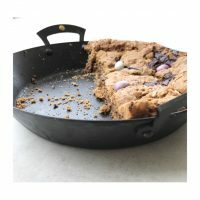 Cooking in cast iron pans gives a lovely crust to the cookie, but not many of us have them at home, so you can make this in a regular non-stick frying pan or a glass or ceramic pie dish. I recently made this in my Netherton Foundry Prospector pan and it worked a dream. This dough can be used to make regular sized cookies, just put balls of it on a baking sheet and cook for 15 minutes or until they are golden at the edges but still a little soft in the middle. Squish two of these cookies together with ice cream in the middle and you’re in heaven. Having played with all sorts of cookie recipes, adding wholegrain spelt flour was the magic touch that made this cookie taste a bit more grown up – like the ones you pay a small fortune for at an artisan bakery. You can make this with regular wholemeal plain (all purpose) flour, but wholegrain spelt flour is easier to digest for many people and has a lovely nutty flavour. Keeping the whole grain when the flour is milled means you retain all the nutrients. Spelt is an ‘ancient grain’, meaning it hasn’t been (if you’ll excuse the scientific language) messed around with and is almost identical to what was eaten in the Bronze age. Modern wheat has gradually been messed with over time, bred to have higher yield and as a side effect has become harder for us to digest. Most people who think they are gluten intolerant find they can eat spelt – although celiacs can’t. Most supermarkets sell wholegrain spelt flour now – even Aldi has it in the UK. In the US I buy it from Whole Foods in the bulk aisle. I use spelt to make our multigrain pancakes, you can use it in loads of baking recipes but it works best in things like banana bread, cookies, scones and gutsy tray bakes, rather than airy cakes. Make the dough and put it in the baking dish or a bag. Leave it in the fridge until you’re ready to bake it. It will sit in there for up to 2 days, but be sure to wrap it tightly so that it doesn’t absorb the flavours from the fridge. Bring to room temperature before baking. If cooking straight from the fridge, add 5 minutes to the cooking time. The raw dough can also be frozen. I freeze mine in individual cookie balls so that I am only ever minutes away from a warm cookie. Dangerous. If I want to make a big cookie, I just defrost a few of the balls and press them together. The bonus of this is that the smaller balls defrost quicker than one big lump. 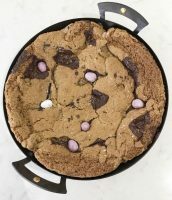 The giant chocolate chunk cookie can be baked earlier in the day and reheated in a warm oven for 5 minutes before serving. You really do want to eat this warm as it is all about the melted chocolate. Preheat the oven to 175°C (155°C fan), 350°F (325°F convection). Use the inside of the butter paper to grease a 25-28cm/ 10-11inch ovenproof frying pan, one that is at least 5 cm/2 inches deep. If you don’t have an ovenproof frying pan this size, use a cake tin or a Pyrex pie plate. Put the flour, bicarbonate of soda (baking soda), baking powder, fine grain salt in a large bowl and whisk together – no need to sieve them. Put the sugar and butter in another large bowl and use an electric hand mixer, or a stand mixer to cream them together. This takes about 2 minutes on medium speed in my stand mixer. The resulting mixture should look slightly fluffy and smooth. With the mixer still running, add the vanilla and the first egg. Wait for the first egg to be incorporated before adding the next. Scrape down the sides. Don’t worry if it curdles slightly at this stage. Add the flour mixture to the bowl and mix at low speed until the flour is just incorporated. Mixing too much at this stage makes your cookie a bit tougher. You may need to scrape the sides of the bowl a couple of times with a spatula to get all the flour in. You’ll be left with a thick dough. Add ¾ of the broken milk and dark chocolate pieces to the dough. Mix again on a slow speed until they are well dispersed. Once the dough is at this stage you can freeze it or keep it in the fridge – see notes above. To bake. Scrape two thirds of the dough into the buttered pan. Use a butter knife to press it gently so that it is in an even layer. Keep the remaining dough in the freezer for another day (see note above). Dot the remaining chocolate pieces around the surface of the dough. Press them in slightly – you want them to be sitting on top rather than submerged for maximum meltiness. Scatter the surface with the sea salt flakes, I use about a teaspoon of the flakes. Try to keep the flakes whole as the joy is as much from the texture as the flavour. Put the pan on a tray as the mixture will double in height and may overflow. Bake the cookie for 35-45 minutes, or until the dough is a deep golden brown along the edge, and the center has slightly set. Unlike a cake, if the center is a still soft, it will firm up as it cools. And even if it doesn’t, there is no hardship. It is still delicious. Remove from oven and leave it to cool in the pan for about 20 minutes before serving. If it has overflowed, use a knife to cut the edges off (cook’s treat) before serving. 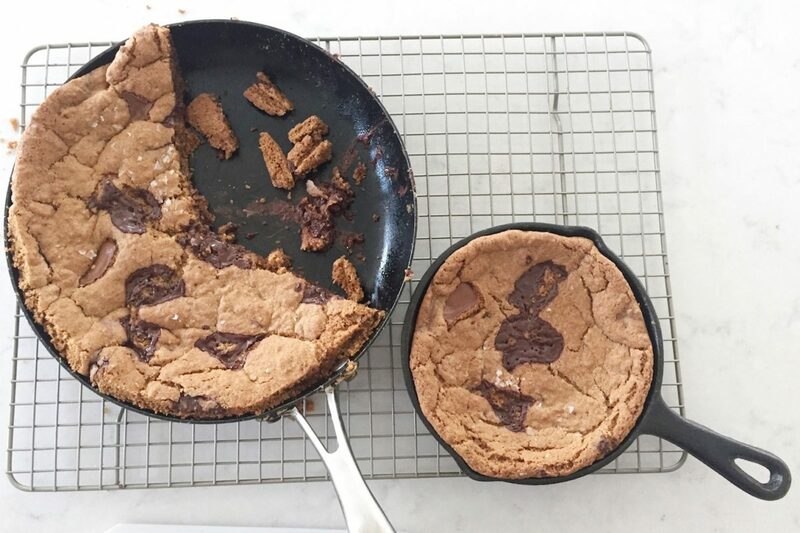 This giant chocolate chunk cookie should be served warm, not hot. I like to take it to the table in the frying pan. Slice it into wedges in the pan. The first wedge may be messy so keep that for yourself. The next wedge will be easier to get out. Serve with a blob of good vanilla ice cream and prepare to be adored. Leftovers are amazing with a coffee the next day – another cook’s treat. Find more recipes for chocolate, cookies, and all things sweet and baked here.